After shorts weather and bluebird skies this past opening weekend, Central Pennsylvania saw multiple inches of rain and tornado warnings early this week, which sent most of the region’s well known fisheries into unfishable territory. Famed systems like Penns and Spring Creek have been out of commission since Monday. Meanwhile, both are expected to fish this weekend. The high water forced us to veer from our plans to film Pautzke Outdoors in the above named fabled waters and retreat to the mountains above State College to salvage the trip. Yesterday, we fished Black Moshannon Creek and Mother Nature didn’t make it easy on us. We were greeted by winds, a three-hour snowstorm an afternoon hail. Meanwhile, the creek was stocked with browns and brook trout and we caught and released roughly a dozen brookies in our group, almost all on Yellow Jackets. Moshannon is one of the few streams in the area that was in good shape this week. Even with a tannic bottom, the system remained clear through the amplified runoff, but saw heavy fishing pressure thanks to Tuesday’s plant. 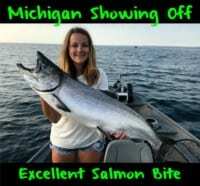 A lot of fish were taken out of the system, but anglers working eggs, spoons, spinners and dough bait should be able to scratch out a few this weekend. We spent roughly an hour on Cold Steam Creek near Philipsburg, which was also stocked this week. Within a few hours of the stock, many of the fish had been caught and the rest were spooked. 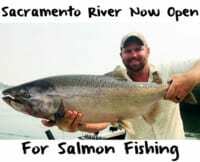 A few anglers caught browns and brooks on wax worms, minnows, spinners and salmon eggs, but by late afternoon they dispersed from the bridge on upstream for 100 yards and downstream a quarter-mile. They’ll be fish available this weekend, but you’ll have to arrive early. The water is gin clear and these trout spook quickly. Yesterday, we spent half a day on East Licking Creek near Mifflintown, which was also stocked this week, but received heavy fishing pressure. The creek was planted with a few browns upwards of seven pounds (this largest fish hadn’t been caught yet as of Wednesday evening) but most where browns and a bunch of brooks that ran 10-14 inches. Throughout the picnic area there were two-to-three anglers pinned to each hole, which made fishing challenging. We caught a few with Gold Label and Yellow Jackets and retreated downstream to the lower section. The browns were being taken with minnows. There was no pressure on the lower section, which hasn’t been stocked since before the opener. In fact, we were the only ones who fished it. While we didn’t hammer them (the lower section was stained) we caught a handful of rainbows and brooks during the last two hours of the day. All fish were caught on Gold Label in this section, which should fish better daily as water clears. The forecast improves throughout Central PA this weekend, leaving an endless opportunity for trout anglers to experience fabulous trout fishing. 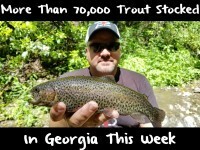 Keep in mind, many of the systems were high and tough to fish this week keeping trout from being yanked out of the systems. The opportunity for success remains high at most planted lakes, rivers and creeks throughout the region. We’ll be fishing Bald Eagle Creek today and hoping the flows have receded. It was running high all week. Meanwhile, one thing we noticed in the handful of Central PA streams we fished is that the rainbows, brooks and browns weren’t in deep pools and holes, rather in the end of runs and at the edge of tailouts. Focus on these places this weekend and you’ll put yourself in a solid position to succeed. Editor’s Note: For more information on trout fishing PA please visit http://www.fish.state.pa.us/fact_fast_trout.htm.